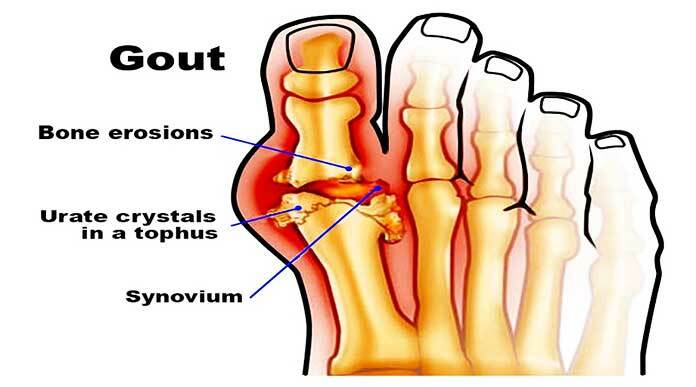 Gout is considered a metabolic disease that causes inflammation in the joints. The swelling can be light and cause stiffness but can also cause severe pain and develop within a few hours. 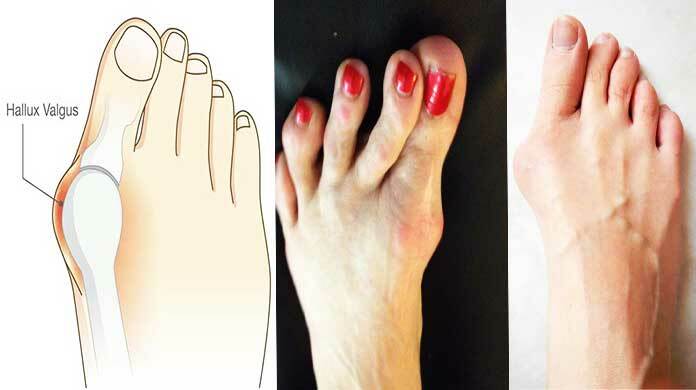 The main cause of gout pain is to be found more than uric acid due to an ineffective elimination of waste or an excess of production of these. Uric acid is formed during the disposal of so-called purines, chemicals contained in many foods and naturally occurring in the body. When the kidneys are unable to expel uric acid from the body, crystals form and deposit around the joints. 1) Consume mainly fresh fruits and vegetables of various colors and unrefined and whole grains. Avoid gluten and dairy products. 4) Try to reduce stress by hiking in the mountains, a bit of physical activity surrounded by nature and meditating in a peaceful environment. 1) Water with lemon is an excellent drink that increases the alkalinity of the body thus preventing the formation of uric acid crystals. Just press half a lemon in a glass of warm water and drink it every morning before breakfast. 2) Another way to increase the alkalinity of our body is to add a tablespoon of apple cider vinegar in a glassful of water and drink it every day before lunch and dinner. 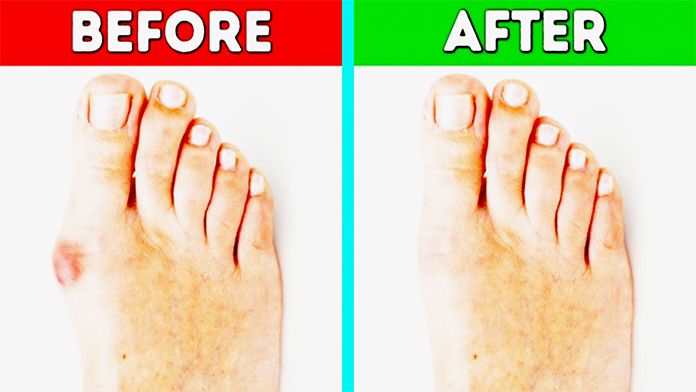 Organisms that are slightly more alkaline than acids can prevent various diseases, including gout. Apple cider vinegar contains malic acid which dissolves uric acid and expels it from the body. 3) Sodium bicarbonate is another useful substance in reducing the amount of uric acid in the body. As prevention you can take a teaspoon of bicarbonate dissolved daily in the water, in case of frequent attacks of gout the daily dose to take is one spoon. 1) The University Hospital of Zurich in Switzerland has discovered the anti-inflammatory properties of the devil’s claw, which you can take in tablets or cream. 2) Fifteen flavonoids, including the canferol (natural flavonol) and the quercetin contained in the parsley, can reduce the uric acid present in the body. Parsley also contains apigenin which inhibits xanthine oxidase, an enzyme believed to be the main agent in the transformation of purines into uric acid. 4) It has been shown that curcumin, contained in turmeric, plays an essential role in kidney protection and is an effective anti-inflammatory. 5) Clinical research has highlighted the anti-inflammatory and analgesic properties of bromelain contained in pineapples. To learn more about the properties of pineapple, see Pineapple is a powerful natural medicine used in the Amazon. 6) Grapes, cherries, and berries contain proanthocyanidins and anthocyanidins (or polyphenols), which Lanzhou Medical College has discovered to have anti-inflammatory properties. 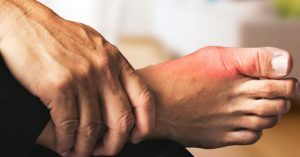 If gout attacks occur, the affected part should be kept at rest and immersed in Epsom salts at least three times a week to reduce inflammation and pain. Doing a 16-hour fast once a week is a great way to get uric acid out of your body, on the day of three weeks you will feel the difference. For more information, see How a 24-hour fast can drastically improve your health.